TFD » Blog » Posts tagged "flowerslondon"
This Halloween, London florist Todich Floral Design created spectacularly spooky Halloween flowers for an eerie night of fun in one of Mayfair’s top hotel bars. 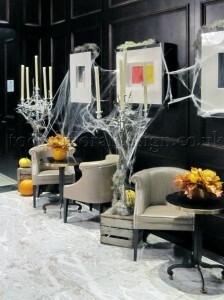 Every week, Todich Floral Design supplies elegant corporate flowers for the hotel and its restaurants, but for Halloween the team there naturally wanted something a bit more ghastly and dark to help set the scene for a scary night in their club. Todich Floral Design is a specialist in event flowers for private clients, hotels and restaurants, and for these Halloween flowers was tasked to create a dark, moody ‘haunted house’ atmosphere that conjured images of witchcraft, monsters and spooks. Of course it also had to work well with the hotel’s décor, which consists of dark pannelled walls and gilt-edged chairs, chandeliers, columns, rich marble flooring and red carpet. The team at Todich Floral Design consequently decided to use gothic style, silver standing candleabras and dark urns atop imposing stone columns, mixed with oak leaves, moss and battered old crates to give the impression of a mysterious old dilapidated and abandoned mansion house. These were topped and interspersed with creepily carved pumpkin faces and cobwebs which cast haunting shadows along the walls. The props and natural materials worked perfectly with the hotel’s interior to create the desired effect, so for one night this luxury bar took on a much more sinister note! Todich Floral Design can cater for a variety of different event flowers and budgets. To order Halloween flowers online or discuss your requirements for another event, click here to contact the team.